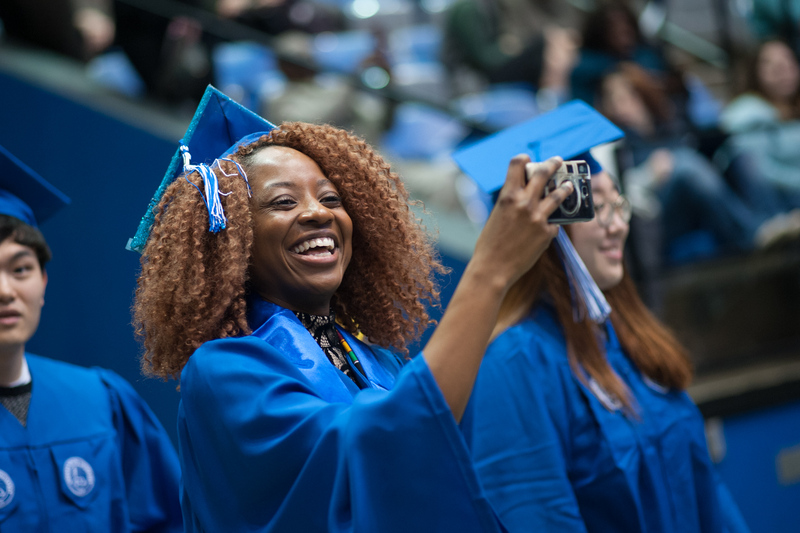 Nearly 900 Sycamores traded in the descriptor of "student" for "graduate" at Indiana State University's winter commencement ceremony Saturday, Dec. 17 at Hulman Center. 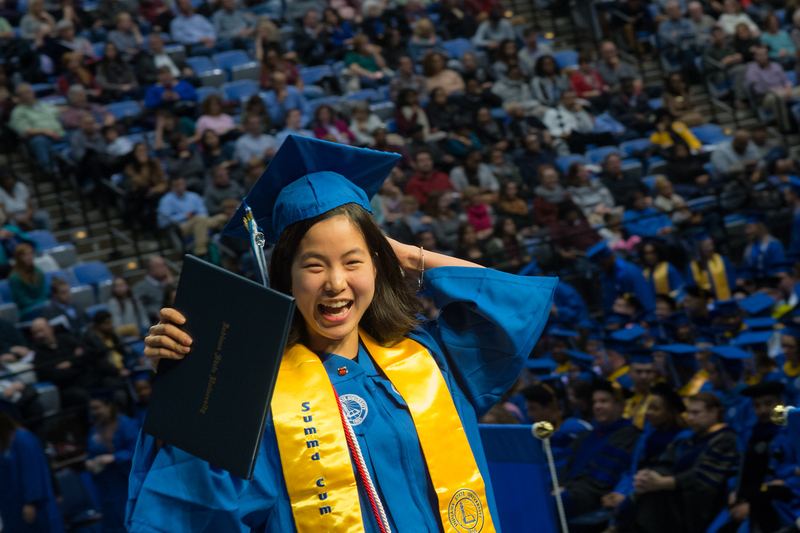 Many newly minted alumni observed the recent tradition of decorating their mortarboards with messages and embellishments, but all wore a look of satisfaction on their faces -- no one more than student commencement speaker Mikaella dela Pena, who describes herself as an unlikely selection for the honor. The sixth-year senior dropped out of college twice and returned (the final time) as a mostly online student. "Now, I hope you don't think the curveballs stop coming now that you've ‘made it.'" They don't, but I wouldn't want them to," said dela Pena, a marketing major from Indianapolis. "I wouldn't want them to, because they are a reminder of how strong we have been, and how strong we will continue to be. "David Foster Wallace said, ‘Everything I've ever let go of has claw marks on it.' Well, I hope everything you hold onto has claw marks on it. I hope your degree has claw marks on it. And I hope the fire you had to set inside yourself in order to get here never burns out. A degree will get you a job, but ambition and willpower... those are manmade." "My hope is that each and every one of you remembers to live," said dela Pena. "Do the things that make you happy, but also do the things that make you better. Do the things that make you a little uncomfortable, and do the things that you always said you would." Alumni speaker Scott Molander, MBA '16, turned a temporary pop-up shop into Lids Sports Group with more than 1,000 locations throughout North America. 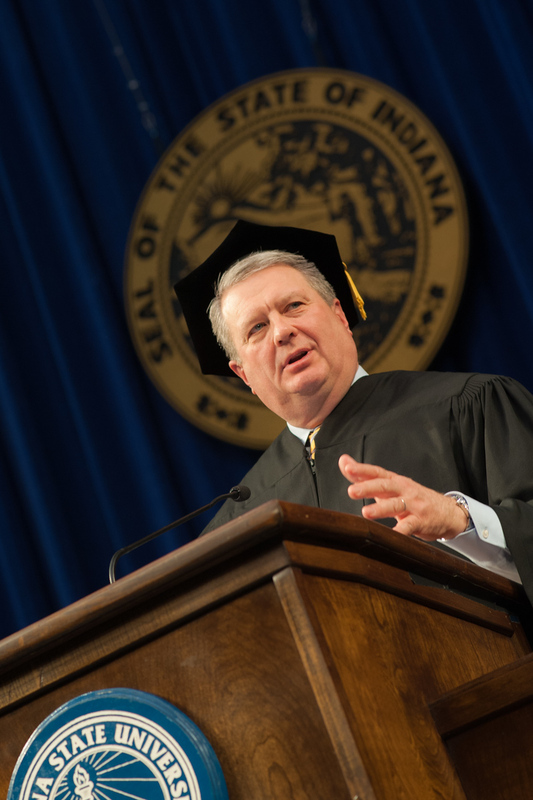 "Remember this," he told graduates, "You can never quit learning. Anytime you think you know it all is the day you're done. For me personally, my last day of learning will be my last day on earth." 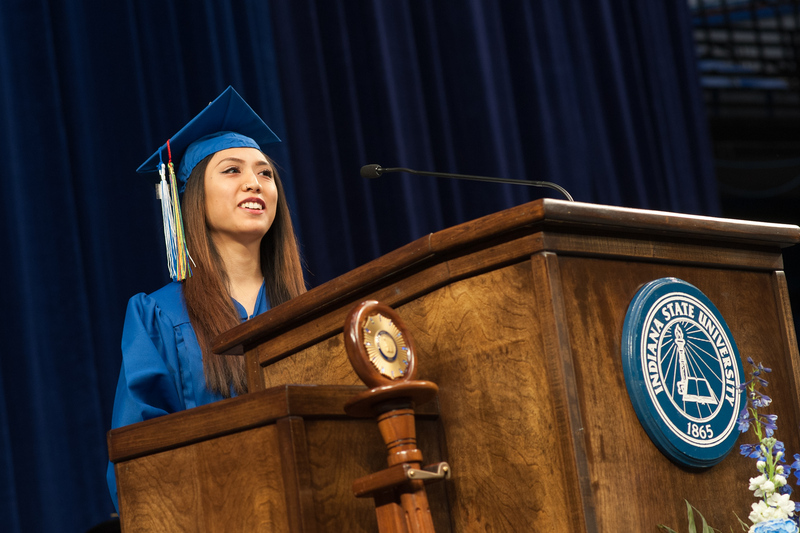 Quoting Michelangelo, Molander encouraged students to aim high in their aspirations. "I had a lot of time to dream and set many goals when I was a young boy sitting on a John Deere R tractor -- without a radio and no phone -- staring at nothing but the big North Dakota sky," he said. "So, please, take the time to dream and set your goals." Molander received an associate degree in business from Williston State College and earned a bachelor's degree in business administration from Dickinson State University. He will be an instructor at Scott College's MBA site in Plainfield starting in the spring. "Wherever you go, you have to have passion for what you do every day," Molander said. "If you have passion every day, you'll have a very fulfilling career. But more importantly, you'll have a fulfilling life." 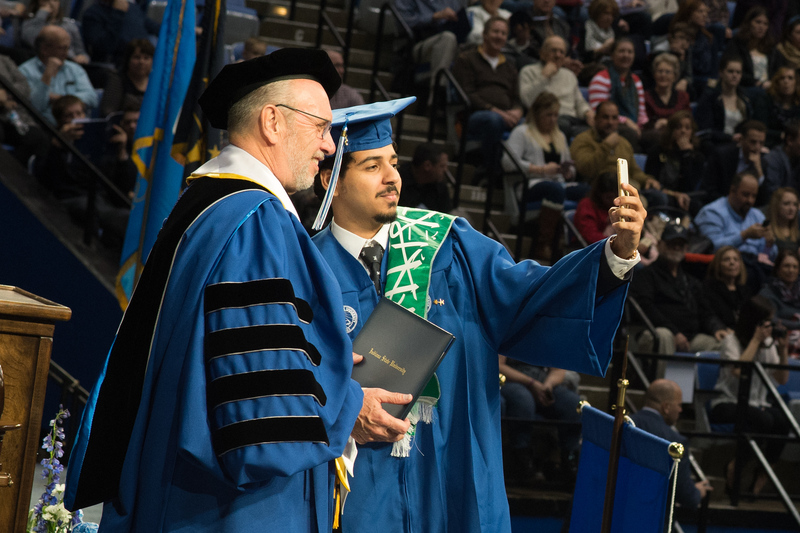 During his welcome address, President Dan Bradley encouraged students to take a thank you selfie and post it to social media with #SycamoreAlum. 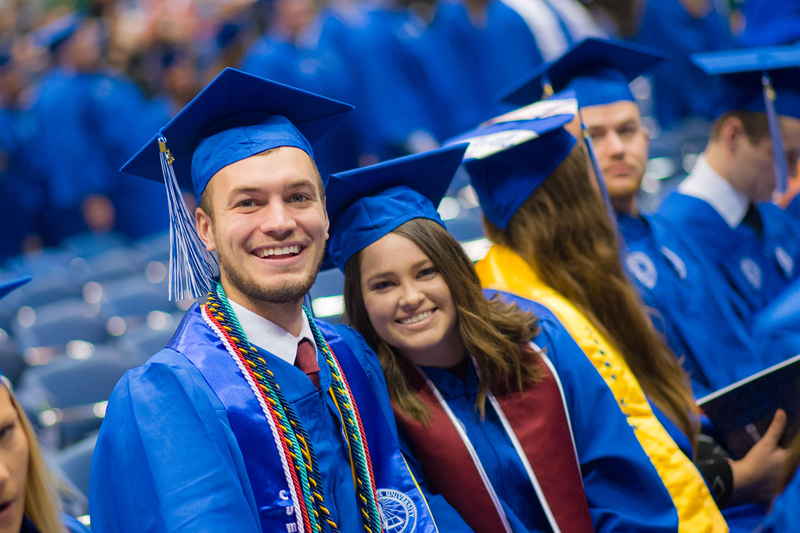 Photos: https://photos.smugmug.com/Events/Commencement/Winter-Commencement-2016/n-HctC73/i-vjLW32b/0/X3/i-vjLW32b-X3.jpg -- Recent Indiana State graduates Dayton Ehrlich and Libby Legett pose for a photograph at commencement on Dec. 17.
https://photos.smugmug.com/Events/Commencement/Winter-Commencement-2016/n-HctC73/i-kMTw7Lf/0/X3/i-kMTw7Lf-X3.jpg -- Recent Indiana State graduate Angelique Bokamba of Congo takes a photograph during commencement on Dec. 17.
https://photos.smugmug.com/Events/Commencement/Winter-Commencement-2016/n-HctC73/i-hT6LvVP/0/X3/i-hT6LvVP-X3.jpg -- HyeIn Ko of South Korea smiles after receiving her diploma at Indiana State's commencement on Dec. 17.
https://photos.smugmug.com/Events/Commencement/Winter-Commencement-2016/n-HctC73/i-jzFvNQr/0/X3/i-jzFvNQr-X3.jpg -- President Dan Bradley poses for a selfie with a recent Indiana State graduate on Dec. 17.
https://photos.smugmug.com/Events/Commencement/Winter-Commencement-2016/n-HctC73/i-hfgm7ZL/0/X3/i-hfgm7ZL-X3.jpg -- Alumni speaker Scott Molander addresses those in attendance at Indiana State commencement on Dec. 17.
https://photos.smugmug.com/Events/Commencement/Winter-Commencement-2016/n-HctC73/i-xL2SjKq/0/X3/i-xL2SjKq-X3.jpg -- Student commencement speaker Mikaella dela Pena addresses those in attendance at Indiana State commencement on Dec. 17.